We are honored to invite you to play an important part in our fundraising event entitled Disruptions in Red: A phenomenal collaboration between a diverse circle of artists, organizations, and individuals that share a common goal to support and strengthen the beleaguered communities of our nation through the Philippine Red Cross. Disruptions in Red will feature 90 art works from 47 of our nation's premier contemporary artists. With your contribution, these works of art will become a symbol for generations, where you can say you had taken part in a determined rebuilding effort for the benefit of Filipinos. 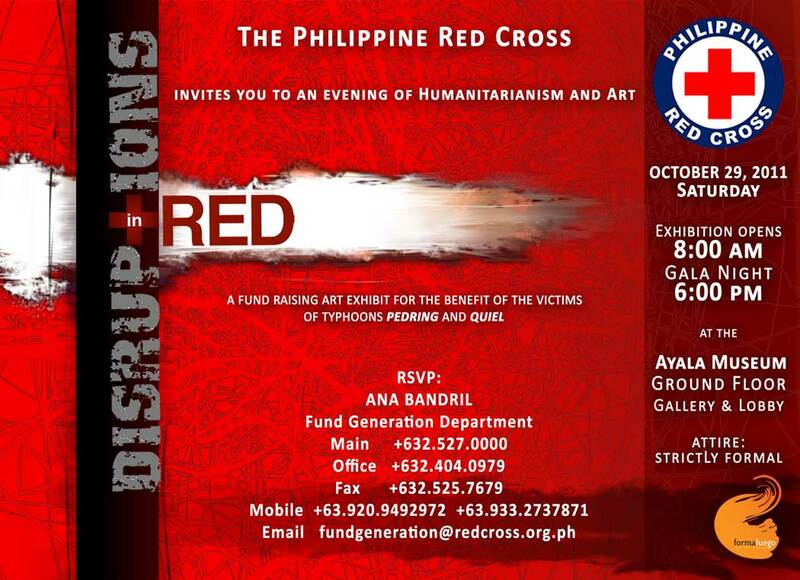 Disruptions In Red will be launched on Saturday, October 29, 2011 at 6:00 PM at the Ayala Museum, Makati. As of this moment, our efforts are focused on the relief and rehabilitation of the victims of Typhoons Pedring and Quiel, which affected nearly 3 million people and caused over Php 8.5 billion in damages to infrastructure and agriculture. Philippine Red Cross serves the most vulnerable communities by deploying its resources and mobilizing its staff and volunteers through our 100 Chapters nationwide. We conduct search and rescue and mass evacuations, pack and distribute relief goods including food and non-food items, provide psychosocial support, first aid, blood, and health and welfare services. We will engage in long-term intervention for the hardest struck cities through Recovery, Shelter, Livelihood, Water & Sanitation, Disease Prevention and Capacity Development Programs. We are appealing for your financial assistance in order for the Red Cross to continue providing its services. You will be given a Certificate of Donation and the artwork of your choice within the corresponding donation bracket. Attached herewith is the list of the available artworks. All checks must be payable to the Philippine Red Cross. Please fax the Pledge Form to 5270575. 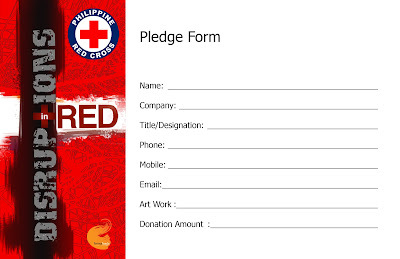 For reservations on art works, please contact Ms. Anacletz Bandril, Officer In Charge of the Fund Generation Department, at phone 4040979, mobile 09209492972 or email anacletz.bandril@redcross.org.ph. In the past 64 years, the Philippine Red Cross has always served Filipinos in every disaster that has bombarded the archipelago. In waging this battle against calamities, we are counting on your support. Thank you.